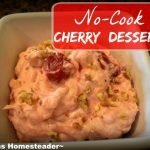 Quick & Easy No-Cook Cherry Dessert Is A Hit! In our family there are certain dishes that are requested year after year for certain family members to bring to special meal gatherings. For my mother it’s her chocolate pies. That delicious family recipe goes back at least to my great grandmother and maybe even further. It’s a highly-guarded secret family recipe. RancherMan always gets requests for his delicious version of green bean casserole. And sister usually gets requested to make her deviled eggs. For me? It’s a dish I call Cherry Shtuff. 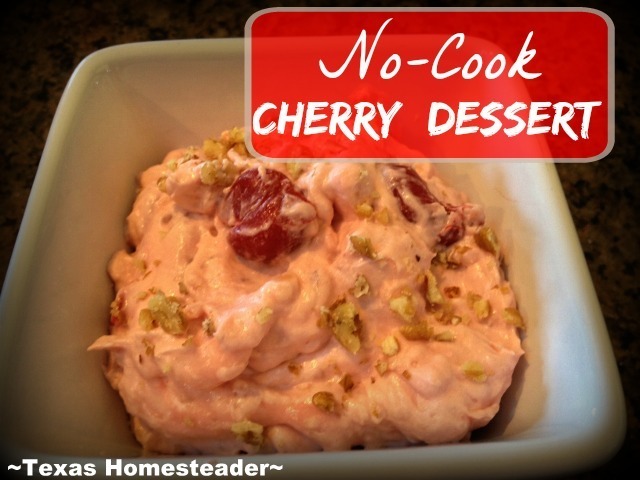 I’m not really sure what its official name would be – maybe cherry salad? Maybe cherry fluff? Whatever the official name is, in our family for decades it’s been called Cherry Shtuff and it’s a non-negotiable part of the holidays! Luckily for me it’s super easy to whip together and requires NO COOKING. First I assemble the ingredients: a can of cherry pie filling (I like Comstock brand the best but it’s pretty pricey so today I’m using a generic brand), a block of cream cheese, a can of crushed pineapple, sweetened condensed milk (I make my own but you can buy a can if you like) and a small tub of whipped dessert topping. UPDATE: These days I make my own Cherry Pie Filling. To avoid a mess I put half the milk and half the cream cheese into the smaller Ninja. Then I whirred it around for about 10 seconds and it was perfectly smooth & creamy. I poured it into my mixing bowl and then I did the second half. Done and DONE! Now that my cream cheese & milk mixture is smooth and poured into my mixing bowl I add a can of cherry pie filling and fold it all together. I stir the drained pineapple into the mixture, and then fold in the whipped topping. You can use the whole tub but I find that it makes it a little TOO fluffy for my liking,. I usually use about 3/4 of the tub. When all is blended thoroughly I typically sprinkle chopped pecans on top to make it look pretty and to give it a light nutty crunch. Now I’m all done – dessert in minutes with no cooking! And because you asked so nicely I’ll share my recipe with you! Drain crushed pineapple & set aside. Blend cream cheese & sweetened condensed milk until smooth. Add Cherry pie filling, drained crushed pineapple and whipped topping and fold until thoroughly blended. Garnish with chopped nuts if desired. Refrigerate until serving. C’mon by & sit a spell! Come hang out at our Facebook Page – it’s like sitting in a front porch rocker with a glass of cold iced tea – lots of good folks sharing! You can also follow along on Pinterest, Twitter If you’d like to receive an email each time a new blog post goes live it’s EASY to Subscribe to our blog! 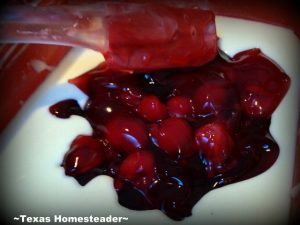 This entry was posted in Blog Posts and tagged Holidays, Recipes on December 21, 2014 by Texas Homesteader. Yummy!! Thanks for sharing on My 2 Favorite Things on Thursday!! Hope to see you tomorrow!! Pinned! Any dish that doesn’t require cooking is amazing in my book! Thanks for sharing at Thursday Favorite Things. I hope you will join us again next Thursday! This sounds really tasty and plenty easy! We’ll have to try it! My mom used to make something like this when I was growing up. Don’t remember what she called it. Thank you for sharing at Merry Monday! 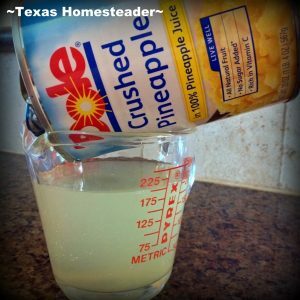 Anytime I use pineapple, I save the juice, freeze it, and then use in my cake batter when making pineapple upside cake or vanilla cupcakes, etc.